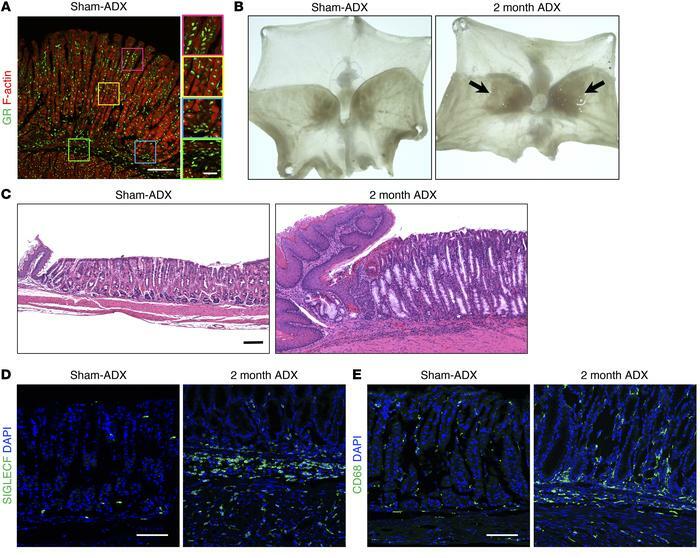 Adrenalectomy induces atrophic gastritis, mucous cell metaplasia, and chronic inflammation of the gastric corpus. Stomachs were collected from mice euthanized 2 months after sham surgery (Sham-ADX) or adrenalectomy (ADX). (A) Representative immunostaining of the gastric corpus lesser curvature probed for the glucocorticoid receptor (GR, green); F-actin was labeled with phalloidin (red). (B) Representative whole-mount images of mouse stomachs opened along the greater curvature. Arrows indicate the location of lesions, which develop after adrenalectomy. (C) Micrographs of H&E-stained sections of the gastric corpus lesser curvature. (D–E) Immunostaining of stomach sections from the lesser curvature stained for SIGLECF (eosinophils, green, D) or CD68 (macrophages, green, E). Nuclei were labeled with DAPI (blue). Scale bars: 100 μm (inset in A: 25 μm); n = 8 mice/group for all experiments.